Blueberry Cornmeal Cakes - Do You Know The Muffin Man? 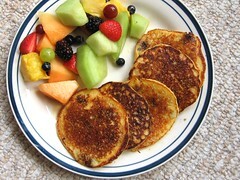 Notes: This is the corn blini recipe with the addition of blueberries. I used a mix of lemon yogourt and whole milk in place of buttermilk. Letting the batter sit for about 15 minutes helped to thicken it, as the cornmeal absorbed the liquid. When I scattered berries onto the batter in the pan, I made sure to press them down. Otherwise, they'll get smushed and bleed when you flip the pancake over. An ice cream scoop ensured uniform sizes: my yield was fifteen 4" pancakes. Very tasty, a nice change from plain pancakes.